« Fireworks sychronized to music played over the radio! Old blue, I like to call them, the Harris 1980’s model transmitters with black faces, white cabinets and blue trim. I have yet to find one that I really like, the FM 25-K is, well okay. Sort of like that 200,000 mile jeep that works, most of the time, and it’s paid for. 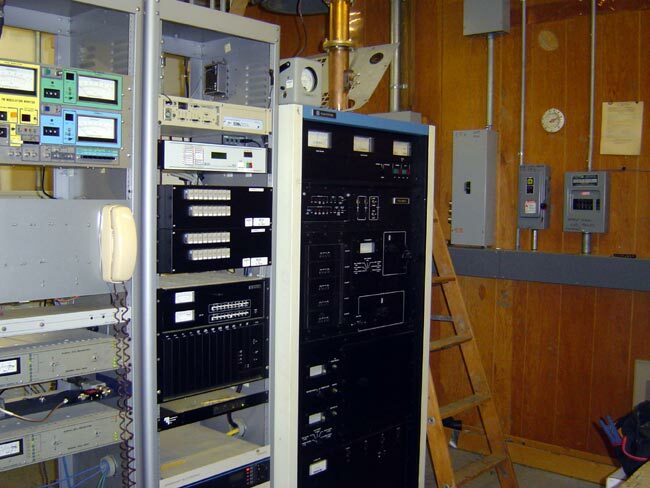 This particular FM-25K transmitter is located at WIZN in Charlotte, VT. This transmitter was new in 1987. It had a bad day yesterday, deciding to throw a temper tantrum and trip the HV power supply breaker. Fortunately, the station has a back up transmitter. When we arrived, we found the HV power supply feed through insulator at E1 arced over and broken. Again, fortunately this station’s management believes in stocking spare parts and a replacement was on hand. This is part of the RF filter for the HV power supply. This happened once before, about two months ago. The replacement insulator then was used, so that might be a factor. Two months ago, both capacitors in the Pi filter and the HV power supply cable (RG-8 coax) was replaced all the way back to the rectifier stacks. The FM25-K can produce spontaneous high frequency oscillations if not tuned properly. We looked at transmitter output with a Rode Schwartz spectrum analyzer and found it to be clean. Exactly why it blew out another feed through insulator is a bit of a mystery. Since the first replacement was a used part, we surmise that it may have been cracked. If this replacement insulator arcs, there needs to be a full investigation. As I said in the beginning, I have found these transmitters to be okay, not the best, not the worst. Most of the problems I have encountered with the K series FM transmitters had to do with the controller cards. There are two, one analog and one digital. That’s what Harris calls them anyway. Like the SX transmitter, and the MW transmitter to a certain extent, the control circuits are way over complicated and full of +/- 5 volt CMOS logic. Having that type of control logic connected to a radio tower (e.g. lightning rod) is asking for trouble. We have recently been having Hydro issues at our site. Our monitoring system allows us to take a meter off of our phases and what we have been noticing lately is high voltage spikes in one of our phases (phase 1). Now I have contacted our local hydro company and they gave me the ” We are within the Canadian Standard limits” bla bla bla. Fortunately it hasn’t spiked enough the shutback our Tx….yet. I’m not sure if these spikes directly related to the summer and extraneous uses of power but it might be worth your while to follow up with your hydro company. The other thing that happened was a wicked thunderstorm the afternoon before, although the transmitter was on the air after that. If it goes off again, I’ll post something else. Okay, true geek questions: Which R&S spec an did you use? I’m a big fan of their handheld FSH6s and FSH18s myself. Or did you need something with finer resolution bandwidth and better phase & AM noise performance? Second question: What’s the transmitter power that blew out the insulators? FSH6 with the tracking generator enabled. It is a slick little unit, not terribly expensive either. The transmitter runs at 24.5 KW, I think the plate voltage is 10KV or thereabouts. In these days of computers, power line transients can be exceedingly troublesome. The power grid is really terrible if you look at it over a period of time with a chart recording oscillograph. 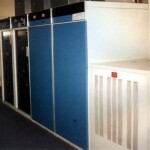 Our original BBL System 6 terminal (1985) wasn’t multi-tasking and had individual processors for the modules. The power line transients caused errors and when a checksum diagnostic was done, the errors were visible. A ferro-resonant transformer solved our problems (Sola Basic Industries) initially and then an excellent Best Power Systems UPS with built in ferro-resonant transformer replaced our switch-mode UPS. No more problems because the transients cannot get through the 60 Hz. saturated core tank circuit of these wonderful transformers. I would think that problems of this type are widespread on the eastern coast of the U.S. because of heavy demands with high population density. Getting a “Hydro” to admit they are giving you anything but first rate power is like getting an attorney to sign a blank sheet of paper. 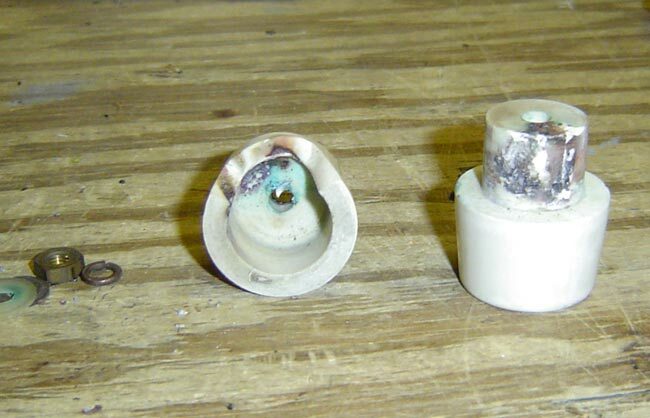 A ceramic feedthrough insulator such as shown is clearly a high stress item. In some respects it is a spark gap for transients but even without any spikes the applied dc voltage can cause long term degradation of the ceramic which leads to an arc path. It has been learned through experience that long term reliability on these two part feedthroughs can be poor, compared to the glazed all-one-piece ceramic feedthrough capacitors made for this purpose (look at Vishay Draloric for an example). One-piece feedthroughs preclude any air getting in between the electrodes where the electrostatic field is high. The unglazed ceramic used with the two piece feedthroughs is porous to some extent and this will lead to moisture penetration and even if glazed on the outside there is none inside where it is needed the most. Basically, inexpensive feedthroughs have a lot of compromises that HV feedthrough capacitors do not. To reduce this field one should chamfer the edges of the hole punched for the feedthrough, this alone will considerably reduce the field. Putting silicone grease around the hole to fill the air gaps will prevent the formation of corona which leads to a decompositon of material over time. This is very effective when using Millen plastic feedthrough connectors. Manufacturers never bother chamfering holes because this adds to the cost. Simply run a deburring tool around the edges then sand them smooth before installing the feedthrough. Most likely the first arc probably left a small crater in the metal from which field emission is even greater, so when repairing anything that arced (such as a wrap-around plate blocker for example) look for pits and if necessary use some crocus cloth or sandpaper to make the surface smooth. Los draiver (Ipa) tienen muchas problemas. Usted debe cambiarlo external RF amplifier.